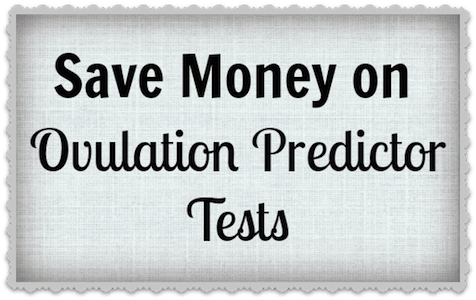 Don't pay drugstore prices for ovulation tests, even if you prefer the fancier digital kind! I've written about how to save money on pregnancy tests. It's so easy to buy them in bulk (you know you're going to take at least one more if that first one tells you you're pregnant! ), and the same holds true for ovulation tests. There are plenty of ultra-basic ovulation predictors available on Ebay, but I prefer to shop on Amazon because the customer reviews speak for themselves! The cheapest package of ovulation predictor strips that I've found is 100 one-step Ovulation LH test strips for $15.99 + $4.99 shipping. That makes each test strip just $0.21! If you don't want to commit to 100 strips, you can buy packages with less strips and they'll cost a few more cents each. All of the tests listed below ship free with Amazon Prime or with purchases of $25 or more. Don't let the minimalist style of these tests scare you. You can pick up a pack of 100 plastic cups for $2.96 with free shipping and you'll be set with nearly the same method the techs use to test your pregnancy at your physician's office! If you want something more consumer-friendly Amazon has the Clearblue Easy Digital Ovulation Test with 20 strips for just $30.71 when you take advantage of the $3 Amazon coupon and order with Subscribe & Save (it's easy to cancel!). Visit the Clearblue Easy Digital Ovulation Test product page. 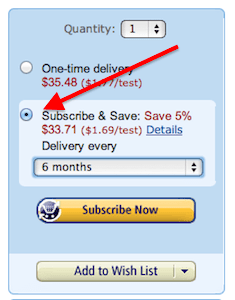 “Clip” the Amazon coupon by looking for the image above on the product page and clicking the box to “clip this coupon”. Click Subscribe Now and complete your order. Your final total will be $30.71 for the test with 20 test strips!